The world will suffer another financial crisis, former Federal Reserve chief Alan Greenspan has told the BBC. "The crisis will happen again but it will be different," he told BBC Two's The Love of Money series. He added that he had predicted the crash would come as a reaction to a long period of prosperity. But while it may take time and be a difficult process, the global economy would eventually "get through it", Mr Greenspan added. "They [financial crises] are all different, but they have one fundamental source," he said. The BBC reports on the first anniversary of the credit crunch across radio, TV, and online. "That is the unquenchable capability of human beings when confronted with long periods of prosperity to presume that it will continue." Speaking a year after the collapse of US investment bank Lehman Brothers, which was followed by a worldwide financial crisis and global recession, Mr Greenspan described the behaviour as "human nature". He said the current crisis was triggered by the trade in US sub-prime mortgages - home loans given to people with bad credit histories - but he added that any factor could have been the catalyst. If it were not the problem of these toxic debts, "something sooner or later would have emerged", Mr Greenspan said. 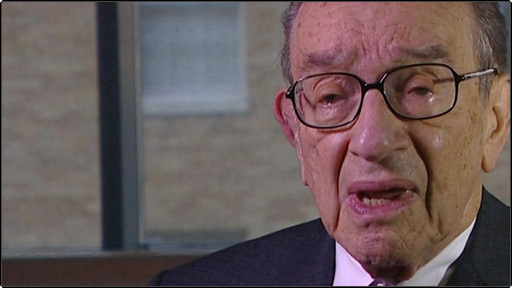 Mr Greenspan, who when he ran the US central bank was hailed as a man who could move markets, also warned that the world's financial institutions should have seen the looming crisis. "The bankers knew that they were involved in an under-pricing of risk and that at some point a correction would be made," he said. "I fear too many of them thought they would be able to spot the actual trigger point of the crisis in time to get out." He also warned that Britain, with its globally-focussed economy, would be harder hit than the US by the current recession and collapse in world trade. "Obviously we've both suffered very considerably but ... Britain is more globally oriented as an economy and the dramatic decline in exports globally and trade generally following the collapse of Lehman Brothers had dramatic effects in the financial system of Britain," Mr Greenspan said. "It's going to take a long while for you [Britain] to work your way through this." In order to prevent the situation arising again, financiers and governments should look to clamp down on fraud and increase capital requirements for banks, the former central banker said. Regulations targeting the latter would mean banks would be forced to hold enough money to cover their normal operations and honour withdrawals. However despite his belief in a brighter future, the former Fed chief did warn that the path to recovery should steer clear of protectionism as applying strict regulations could hamper recent developments that have opened up global trade. "The most recent endeavour to re-regulate is a reaction to the crisis. The extraordinary impact of these global markets is making a lot of financial people feeling they have lost control. "The problem is you cannot have free global trade with highly restrictive, regulated domestic markets." During the interview for BBC Two's The Love of Money series, the former Fed chief said the current economic crisis was a "once in a century type of event", and one that he did not expect to witness. Blamed by some for not doing more to prevent the crisis, Mr Greenspan denied any responsibility for the problems gripping the global economy. "It's human nature, unless somebody can find a way to change human nature, we will have more crises and none of them will look like this because no two crises have anything in common, except human nature." 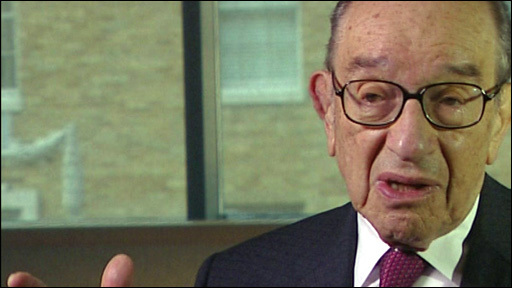 Alan Greenspan was interviewed as part of BBC Two's Love of Money series to be broadcast at 2100 BST on 10, 17 and 24 September. G20 map: Who has spent the most? Mood Map: Has Your World Changed? Expert opinion: Is the recession ending?